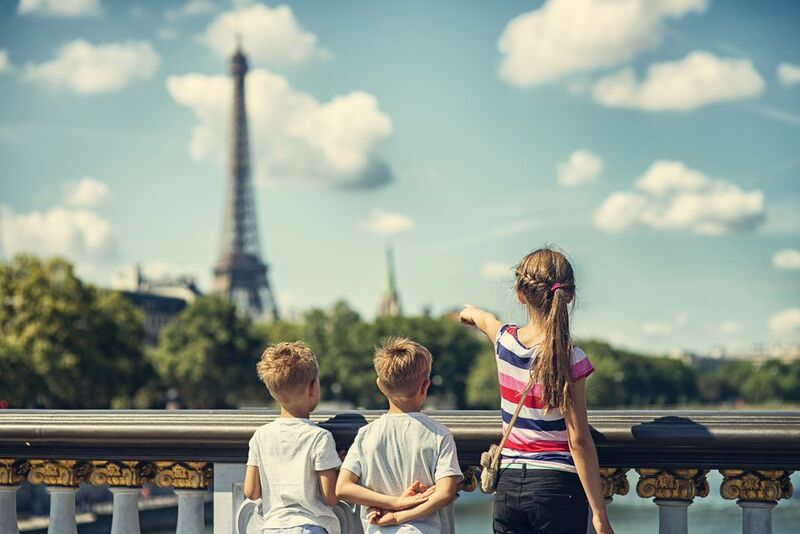 From Paris to Eurocamp, there are so many ways that families can have a wonderful trip to France. Discover our favorites. Paris is a terrific city to visit with kids. Simply strolling the streets is fun, and there’s always a patisserie with delectable pastries at hand or a café where you can sit down and have a snack or drink. During the summer months, Paris even gets a beach, the Paris Plage. And bonus for families: The Louvre, the Musee D’Orsay, and a number of other museums are free for kids up to 18 years old. It’s also free to tour the landmark Notre Dame Cathedral. For a different theme park experience, also near Paris, try Parc Asterix, beloved by French families, and dedicated to the humorous world of the Asterix comics which have been hugely popular in France for decades (and which are available in English translations.) This theme park will probably be a French-language immersion! Our own family experience there was lots of fun. All-Inclusive Club Med: Try a Ski Resort! North Americans flock to Club Med's all-inclusive resorts in Mexico, the Caribbean, and Florida: families love the excellent kids and teen programs, the emphasis on active fun, and the unique friendly ambiance thanks to the Club Med G.O.'s. Club Med has many more resorts worldwide, including all-inclusive ski resorts in France and Italy, which partner with ski schools to offer skiing and snowboarding lessons at all levels. Club Med resorts are an especially good choice for families with young adult kids, thanks to the friendly atmosphere created by the G.O. 's, the focus on active fun, and the signature evening entertainment. Club Med has popular all-inclusive resorts in France for summer, too, such as the family-friendly Opio en Provence resort. Here's another strategy for a family vacation: why not go to the places where French families go? Such as Club Med all-inclusive resorts (above), or Center Parcs "holiday villages", or Eurocamp (below.) Center Parcs are a particular type of family-friendly property with large recreational grounds and many activities for kids; the chain has twenty "holiday villages" in France, England, Belgium, Germany, and the Netherlands. Center Parc's signature feature is a large domed building that houses a landscaped tropical pool, plus play zones, restaurants, shops, and spa. Some of the tropical pools have waterpark features such as wave pools, kiddie pools, waterslides, etc. Outdoor activities, meanwhile, might range from archery to zip wires, rafting, tree climbing, and horse riding. Accommodation includes large units with multiple bedrooms and full kitchens. Having a car also opens the door to vacation home rentals: find a place, make it your home base, and explore the surrounding area. This type of vacation can be great for families: kids can spread out into multiple bedrooms and have "normal life" conveniences like a yard to play in. And of course, with your own kitchen, you can take full advantage of the delicious cheeses and other wonderful foods of France. Eurocamp has 160 parks in France, Italy, Spain, Germany, and other countries. Make a Eurocamp "holiday parc" your home base and explore the region, or "park hop" and explore more areas. Pricing is per family, and kids under 18 are free; kids' club is free, there's free use of toddlers' crib-playpens, soccer clubs, and more. The Eurocamp website has a section showing activities for toddlers, teens, and other ages. One of the great things about travel in Europe is that budget-style travel is acceptable, and even respectable, for all demographics. Budget lodgings come in several types, including "pensions" and other modest hotels, but don't rule out what was formerly called "youth hostels". Hostels have grown up and while some do still cater to the youth crowd, many now welcome families. Often, these hostels have character buildings—such as the Villa Saint Exupery Gardens in Nice in France, which is a converted monastery in a quiet residential area. Families can book private rooms (and yes, rooms do have en-suite bathrooms), and the hostel offers free babysitting*.